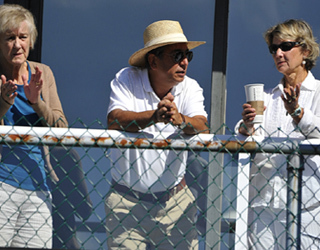 Patricia McLachlan, Mamood Gouneili and Gill Eston (president of the West Vancouver Tennis Club) overlook the courts. This popular event is usually a warm-up for the Senior Nationals, however, the timing of this years' event (August 27 - September 2) was a bit late and many players went to play the National event back East. Hopefully next year the timing will work out better to allow more players to participate in the Senior's Open. Photo 1 (left): Left to right, Debbie Maloon, Paul Tornquist and Carol Lau. Carol topped Debbie for the Women's 45 Singles title. Photo 2: Al Lawry, left, and Ian Stewart. Al beat Ian, 6-3, 6-0, in the Men's 55 Singles final. Ian made it to the final last year and maybe he will be lucky next year since third time's the charm! Photo 3: Kim Le, left, outlasted Tatiana Petrova in the Women's 30 & 35 Singles final, 2-6,6-4,11-9. Kim also played the Women's 45 Singles where she lost to Carol Lau in the semis, 6-4, 6-3. Photo 4: Garry Field, left, had his chances in the second set but came short and lost to Gary Gilraine, 6-2, 7-6, in the Men's 65 Singles final. Photo 5: Gill Eston congratulating Bill Nordmark for winning the Men's 70 Singles. Photo 6: Ling Feng returning the ball to Robin Naidoo in the Men's 35 Singles final. Ling beat Robin, 7-6, 6-1. Photo 7: Meet Claire and Norm Allan. Thanks to Claire for the draws, scheduling and updates.